Hey everyone, it’s time for your weekly update! After an exciting week last week this week has been a lot more relaxed. 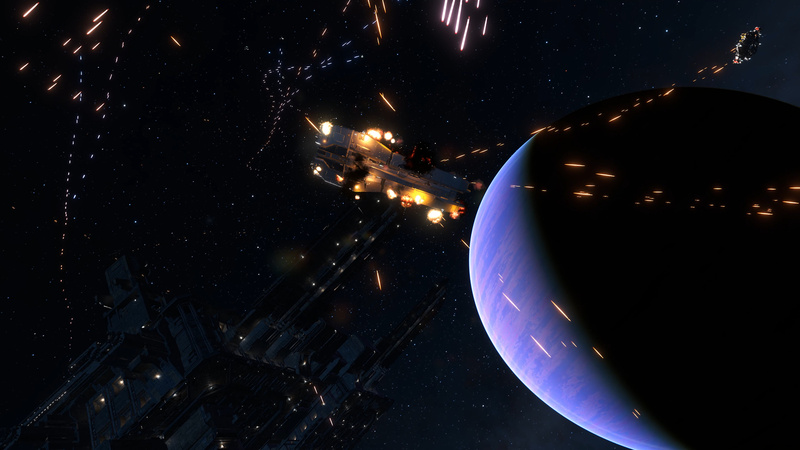 It’s back to the regular grind working on capital ship weapons, implementing feedback from the Alpha backer weekend, and incremental patching. The release of the Alpha is just around the corner and there’s a lot of work to be done to get the core gameplay loop properly mocked up. Among other things this includes the resource system, cargo ship AI, sensors/radar, repair/re-arm, and carrier spawning. On the art side there has been work on some additional HUD improvements. Along with that we’re working on improving special effects, texturing improvements, and the carrier final geometry. We want to get to the point where we’re releasing a new patch roughly once a week but there’s a handful of larger systems that need to be completed over the next few weeks before that’s likely to happen. That’s pretty much it for now, there should be more to talk about next week! Thanks for the update Keith. We want to get to the point where we’re releasing a new patch roughly once a week but there’s a handful of larger systems that need to be completed over the next few weeks before that’s likely to happen. What’s that supposed to mean now? Last week it sounded like you were already at a point where this could happen now. From the wording in this update it reads like what was told to us back in Kickstarter times and all the way up until now. I just translated it to “Never”. As said many times. We don’t care about broken updates that do not work, better than being weeks/months behind internal builds and then, when there is an update, discussing like 20 overlaying changes that all influence each other and comparing them to vague memories. If an internal decision has been made that updates are still not worth the time invested in them and/or feedback is currently not needed please tell us that instead of telling us “eventually” it will be needed and stuff “needs to be completet”, you decided that it needs to be. Feel free to tell us trough other means if you want to keep the updates in this, vague, format. Guys, do at least a simple GUI to configure the HOTAS!! I can’t fly with mouse\keyboard, having a full HOTAS and pedals, but now I can’t configure multiple controllers. For the simulator, control settings section is one of the most important! I guess a gui for input mapping will only ever come when the new UI engine work is completed. In the profile folder are xml files you can modify. Using hotas is already possible, I did it myself. The input has to come from one device currently. If you are using more than one device you can combine them to a virtual device using vJoy. I’m sure there will be an UI to configure all of this in the later stages of development. I wrote up a thread that describes how you can get your setup to work in the current build of the game. Using multiple devices simultaneously needs a workaround but it’s doable, although labor intensive. This thread should really be a sticky! I am a bit surprised to read this and how you’re interpreting what Keith wrote so negatively. That’s a bit of an extreme interpretation. We eventually want to settle on a weekly patch schedule, but there are still some major game systems that cannot be implemented in a single week and have to be spread over many weeks. Like the game loop / resources, replays, in-game map, haulers etc… so it’s probably that we’re going to have unregular patches for a while, probably every 1 to 3 weeks. What ? Now I’m totally confused. If anything, we are currently lacking feedback. Or more exactly, more diverse feedback from more community members, as it’s pretty much always the same people giving their opinions. Right now is the best time for feedback, you know, because as we reach beta, everything is going to be set in stone and only minor suggestions could be tweaked, not major gameplays sytems. So if anything, right now is the time to voice your opinion if you want to make an impact on the game. Yeah for me it will be HOTAS and or Xbox gamepad type controller. One of the newer xbox controllers or 3rd party ones with lots more buttons and paddles etc. Keyboard will be onhand but for me its gotta have a nice easy to use GUI to set up HOTAS (maybe even dual stick), and xbox pad remapping GUI. Hopefully. We just want you guys to stop teasing and committing to any future related ‘dates’ @inovaeflavien, because you always miss them and we end up dissapointed. 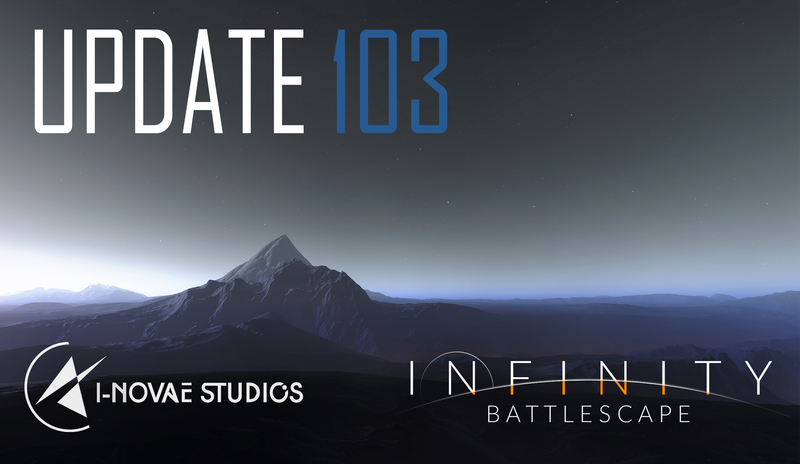 Our internal schedule is currently to release the next patch sometime in August and ship the Alpha 1-2 months after that. We'll resume gameplay iteration upon the release of the next patch. We have been told this a few times already, it was even in your KS pitch. Thanks for the answer Flavien. In that case it was some major misunderstanding. Thank you very much for clearing that up. To me it sounded like any patch is pushed back until all of these “handful of larger systems” are complete and only then will the weekly updates commence. The way you described it just now is totally understandable to me and I agree and understand that some systems need more time to do than a week. The wording in the Update post just sounded like there was an internal decision in the direction I mentioned and one that is not communicated to us in order to not disappoint anyone. Maybe the compression that happens in order to get a good update out made this happen. Sorry for working myself/others up then. I can see how more diverse feedback is wanted and welcome it. The last few updates had quite good changelogs and hinted at what feedback is wished for but there were quite a few threads all over the place and it was a little confusing. Informing Dev Access backers about a new patch including as well as link to a specific discussion/feedback topic (maybe inside the changelog) with hints what stuff you are interested in especially is could maybe help a little. I liked the thing you did with the last patch and the info inside the changelog/launcher. I’m sorry ? Keith said that our goal was eventually to do weekly patches. How is that “teasing and committing to any future related dates” ? I’d just like to voice an alternative opinion - I would much rather you continue talking openly about your intentions and anticipated timeframes. I did not interpret the post in the same way that @Lomsor and @cybercritic appear to have done. When Keith says ‘next few weeks’, I think it’s clear that that’s not a commitment to weekly patches in X weeks time. Keith’s idea of ‘a few’ may be 3 weeks, maybe 5, and either way it will probably take longer. When Keith mentions a date it’s BS 95% of the time, all I’m saying is, please stop giving us future commitments. Talk about the past, talk about the present, leave the future, you are very bad at it. That requires more active players, simple as that. We have previously discussed ways to boost player participation in events and such, so not gonna repeat that. One way to possibly increase feedback participation by non-regular players could be to emphasize in weekly updates how feedback was incorporated into changes you made, citing specific examples. We as regulars are very aware of the feedback you got and the changes you did, non - regulars will not be. Making more obvious how the feedback directly influences your development course could encourage more diverse feedback. Maybe. As a (very) regular reader and lurker in this forum, I’m not even sure how / when the feedbacks from active members were integrated, if ever. Could be I’m wrongly reading the weekly updates. As a (very) regular reader and lurker in this forum, I’m not even sure how / when the feedbacks from active members were integrated, if ever. The 0-9 being used for setting speeds is a little excessive, but I like the strafing controls the way they are. Could we instead keep those, and have a “Select next preset speed” button? E.g. press ] to cycle through 100… 250… 500… Etc. And [ to cycle back. Mouse wheel could still control it more analogue-y, and it frees up the numeric keys for weapon-related stuff (which is perhaps more familiar to people). Allright, the target speed cycling has been implemented and will be available in the upcoming patch ( in a few hours ). Event names are “NextTargetSpeed” and “PrevTargetSpeed”. I’ll bind them to F5/F6 for now. The autowarp feature was a suggestion by the community too. We also had discussions about ship durability that were implemented by Flavien as far as I recall. Other things like freely moveable outside camera and other feature suggestions that were implemented/added to the ToDo list etc…We gave feedback for missiles, they got improved accordingly. I do believe at one point we also talked about atmospheric max speeds, they also got bumped up as suggested. That is just what I can remember right now. The input has to come from one device currently. Yep, that’s the problem! now I have multiple devices and I can’t configure them via XML. If you are using more than one device you can combine them to a virtual device using vJoy. I don’t want to bet third party programs because I have to reconfigure controls in all my games. I think now the normal is to have native support for multiple devices initially, especially if it’s a simulator, not an arcade! so I’ll have to wait for support, I won’t be able to test Infinity - too many unnecessary things to do for a couple of flight hours. I hope the developers will think about it. I assure you, you wont. Your controllers will still be visible to your games just as they are currently. You’ll just have an extra controller (vJoy device) in the list available for binding. I only have one controller but I use it through vJoy with UJR (precursor to UCR) because it gives me total control over deadzones at both ends of axis, total control over the response curves, I can use my one physical throttle to control two separate virtual throttle axis by toggling between them with a button. I can’t imagine using my controller without it. This is kind of where I’m at too. I’m keenly aware of my own speculative suggestions and how they may be out of scope for the final product. I’m in a wait and see mode mostly because I’m not sure where everything is going. My main quandry is probably around energy management. Is there going to be any experimentation with more detailed systems, or is this pretty much the final form with a bit of tweaking? Since it’s a subject that touches on balance for so many other things, I hesitate to make suggestions on things like warp and mobility versus survivability. They could all change in a heart beat if we make any significant changes. It does no good to suggest changes that exceed the intended scope of the final game. So I can really only talk about what is there, and I’m kind of at a point of saying “It is what it is” at the moment because it’s pretty decent and really only needs a few tweaks. I just wonder if it could be better and still be as approachable as we want it to be. I do worry about the game being engaging enough to bring players back week after week.